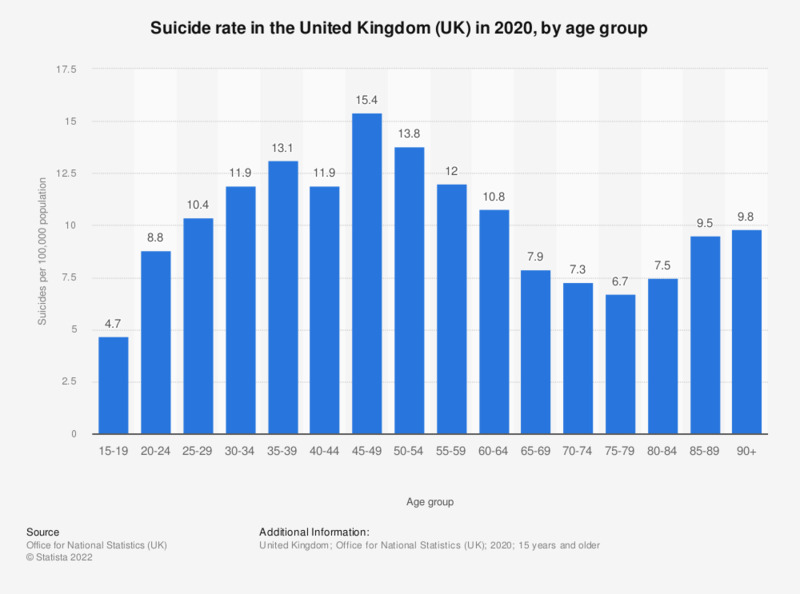 This statistic shows the suicide rate in the United Kingdom (UK) in 2017, by age group. The age group with the highest rate of suicide was those aged 45 to 49 years, at 15.6 deaths per 100,000 population. *In the United Kingdom, suicide is defined as deaths given an underlying cause of intentional self-harm or injury/poisoning of undetermined intent. Figures are for persons aged 15 years and over. Age-standardised suicide rates per 100,000 population, standardised to the 1976 European Standard Population. Age-standardised rates are used to allow comparison between populations which may contain different proportions of people of different ages.